Back pain is reportedly causes 4.5 million days off work every year in the UK, along with a lot of stress and pain. There is a whole range of gadgets, from the cheap to the expensive, that can help reduce or prevent back pain, especially at work, and while they won’t all work for everyone, there might be something here that can help. These provide extra support in the small of the back. These can be inflatable, so can be adjusted to provide the optimum amount of support, and may include straps or Velcro to allow attachment to a chair back. There are lumbar support cushions for car seats, and some desk chairs have adjustable lumbar support built in. A rolled up towel can make an emergency lumbar support cushion. Exercise balls can be used as desk chairs, or as seats in any room. Sitting on an exercise ball improves posture, as it’s impossible to slouch and balance at the same time, and also could help strengthen core muscles as well, which support the back and might prevent future cases of back pain. Make sure it’s big enough to sit at a desk with elbows just above the desk top and feet flat on the floor and build up the time using it, as it can be tiring at first. Sitting still for hours can lead to stiffness and back pain. It’s virtually impossible to sit completely still on an air-filled cushion, and, like an exercise ball, balancing on the cushion will work on the core muscles too. These can be used on any chair. 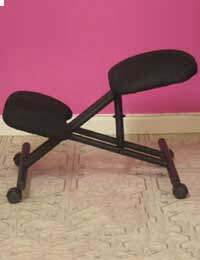 These are chairs with seats shaped like bicycle saddles, and like exercise balls and air-filled cushions, increase movement and improve posture. Saddle seats may be uncomfortable for long periods of time. The ideal angle between the body and thighs is about 135 degrees, and a wedge cushion creates this angle by making sure that the hips are higher than the knees. These can be air-filled to have the same effect as a fit ball or air-filled cushion. Kneeler chairs, which have a seat pad and a knee pad, improve posture and create the ideal angle between the body and the legs, but can be a strain on the knees. Copy holders raise books or paperwork up to eye level, reducing the need to twist around or look down, which takes the pressure off the neck and back. Laptops have revolutionised computing on the move, but using a laptop on a lap, table or desk is not ideal for people with back pain, as the screen is too low. Using a laptop stand raises the screen up to eye level and improves the angle of the keyboard. Laptop stands can be used on tables or desks, and some can also be used on laps (and will also reduce the heat transmitted to the skin). Many will fold flat and go in a laptop case.